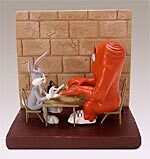 Bugs Bunny: Hare Ball – This is a fine art Limited Edition Sculpture featuring a classic moment inspired by the hilarious 1946 “Baseball Bugs”. 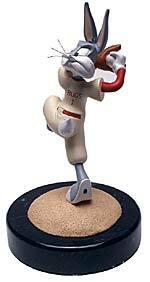 Bugs winds up to deliver his famous ‘hare ball’…a great companion to the Foghorn ‘Fowl Ball’ Sculpture. Foghorn Leghorn: Fowl Ball – This is a fine art Limited Edition Sculpture made in cold-cast resin capturing a classic Looney Tunes moment. 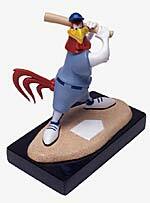 This terrific sculpture features Foghorn at bat…a great companion to the Bugs Bunny Hare Ball Sculpture. Monster Manicure: Bugs & Gossamer – This is a fine art Limited Edition Sculpture featuring the classic manicure as Bugs says ‘Monsters lead such innterresting lives”. Includes display case. Extremely limited availability. 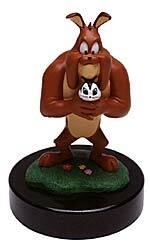 Marc Antony & Pussyfoot – This is a fine art Limited Edition Sculpture features Marc Antony holding Pussyfoot in a classic moment from the hilarious cartoon short ‘Feed The Kitty’ directed by Chuck Jones in 1951. 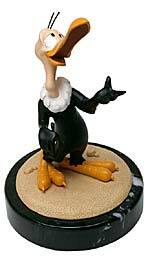 Beaky Buzzard – This is a fine art Limited Edition Sculpture featuring the bashful Beaky Buzzard inspired by classic moments in cartoon shorts such as the 1942 ‘Bugs Bunny Gets The Boid’ (his name is actually ‘Killer’ in that cartoon) and the 1945 ‘The Bashful Buzzard’ (also nicknamed ‘Killer’).